We have all been in the same place as you as your are about to start your first year teaching and we wanted to give you some thoughts and advice from our individual perspectives. Below are 19 different letters from teachers of various subjects (mostly math and physics). The letters are also compiled as a Google Doc or pdf for those who would prefer the advice in that form as opposed to clicking through various teaching blogs. If you are looking for great teachers to follow on twitter and great blogs to read, this is a wonderful (though of course not complete) list that would be a great place to start. *Note 1: If you would still like to submit a letter, go for it! I will update, and Drawing on Math will still compile them here. *Note 2: The quotes I picked for each post are not the titles of the original posts as written by the writers – they are somewhat random quotes from somewhere in their letter that I thought were poignant, unique, or interesting. This is from Tom H, a friend from college who teaches middle school in China. His advice isn’t written out in prose, but the way he organized I thought was really interesting – problems he was initially having, how he addressed it, and what happened from there. 1. Seldom engaged in class. Misbehavior negatively affects other students in a serious way. 2. Misbehavior spreads throughout the classroom. Other teachers become involved and punish students. 3. Students act like little kids. 1. Consistently maintain high standards, both behaviorally and academically. At the same time, differentiate work and goals for students that really struggle. 1. Students begin to quiet down in class and engage in the material. Students that were previously misbehaving misbehave less. Students that were distracted now have a healthier classroom environment and can concentrate better (and for those that were influenced to misbehave, they became more interested in the content and began to do better in class). 2. Instead of students talking, randomly switching seats or throwing things to get attention, they sit quietly and do their work to get your attention. Students who do well see that their success, whether behavioral or academic, has positive outcomes. Seeking recognition, students work harder. 3. Students naturally mature throughout the year. It’s our job as teachers to be patient with students, be a good model for them to look up to, and eventually help them to change when they feel they’re ready. We can influence them in small ways and encourage them to change, but I haven’t had much success with any method other than ones that require patience. We have to be there for our students when they’re ready to change. A few things before I get to my letter to a new teacher… first, I must give credit where credit is due for “Letters to a First Year Teacher.” This was not really my idea. I was trying to collect advice for a friend of mine who is beginning to teach and crowd sourced Twitter for ideas. I was going to collect these ideas in a document and send them to her (and post on my blog for others to use). And then this mini conversation happened… while I was asleep (read from the bottom of course, like on Twitter). I know that some people get their best ideas when they are asleep. I guess I do too – they just happen to be from other people.Thanks to Sam and Tina for the inspiration and really thanks to Bree (@btwnthenumbers) for the actual brilliant idea. Also, I will compile the submissions in the next few days into both a blog post and a pdf. I picked a really silly time to do this – I’m leaving Jordan tomorrow for the summer and have to pack for 2 months of traveling around and seeing friends before making the basically day-long trip back to the US and then dealing with crazy jet lag when I get there. So the compilation might take me a few days. But first, I have to submit my letter! A lot of the other ones do a great job at helping teachers prepare for the psycho-emotional-roller coaster that is your first year of teaching, so I am going to focus more on the mechanics of teaching (and essentially post the document of advice I was going to create anyway instead of a real letter). It’s almost silly to wish I knew what I know now when I started teaching. What a dumb cliché the more I think about it. No matter how much you read now, or think you know before you start, teaching is hard, and the best way to learn it is just to get out in the trenches and do it (though I might be biased as someone who loathed the undergrad education classes I suffered through before I changed my major from education to math). That said, it doesn’t hurt to have an idea of what issues you are going to face, and I think that’s the real power of reading letters of advice from current teachers. I’m going to split my advice up into the three real areas of day-to-day teaching life: planning, teaching and reflecting. Focus on how students are learning the content more than the content itself. Despite what first year teaching Bowman might have thought, a 2-3 page narrative of what you are going to say in class not only takes forever to make but isn’t really that useful in the end. The content is important, but the hard part of teaching any subject isn’t the subject itself. So instead of poring over the content, try to develop a grab bag of learning modes that will help you teach the content (like in Sam’s Virtual Filing Cabinet or Kate’s various review modes or some of my skills instruction ideas). The more structures you have, the quicker planning will be and the more students will learn. Plan in 10-15 minute chunks. I use a table in Microsoft Word to plan, and each new chunk is a new row in the table. This is for a few reasons. First, you have no idea how long things are going to take in the classroom your first year, so planning in chunks allows you to move stuff around easier, like moving something to the next day if you don’t finish, or starting something up that you thought you were doing to do tomorrow. Second, the attention span of teenagers humans is about that long, so planning in chunks allows your classroom to flow more easily and keeps students engaged. Lecturing isn’t bad, but lecturing for 45 minutes is. Having students do practice problems alone sometimes works great, but expecting them to sit there and practice alone for 45 minutes is asking a lot. If you follow the previous bullet point and get a tool box of learning structures, this makes planning in chunks even easier. Beg borrow and steal. It would be fun to try to figure out how many times the class “Algebra II” has ever been taught – not only are other teachers okay with you stealing their ideas, they really encourage it (and they probably stole said ideas from someone else in the first place). 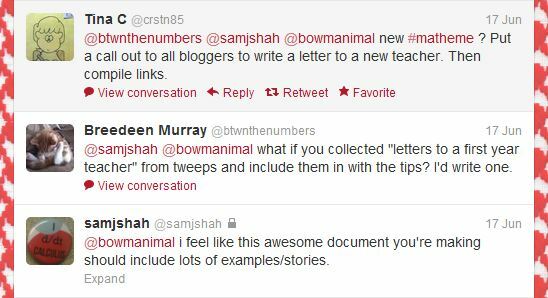 I love trolling around blogs for ideas (again, Sam’s Virtual Filing Cabinet is a good place to start for math), and really wish that had done more of the same idea-seeking with the teachers in my department at my school my first year. Observe lots of classes and ask, ask, ask other teachers for ideas all the time. No one will think you’re stupid for asking. In fact, they will think you’re smart. Also, if you are looking for some books to read before you start with some steal-able practical nuggets, two I would recommend are Lemov’s Teach Like a Champion and Wong’s First Days of School. Both can be cheesy at times and have some dud advice mixed in with good tips, but I remember reading both of them and being so thankful that they got me thinking about the right things and gave me some practical ideas to try. Assessment is part of planning – consider Standards Based Grading. A real game changer in my classroom was switching to Standards Based Grading (SBG), which is a system of grading where students are grading on specific learning objectives (rather than a percentage on a test) and those grades evolve over the course of the term based on student learning (instead of grades reflecting how much you knew at the time). Even if it is too much to adopt in your first year, reading about it is so worth it to think about the role assessment plays in the classroom. My favorite takeaways: learning objectives should be clear and well defined, assessment results should be used to guide both student learning and your teaching, and learning should be thought of as a process instead of a one time thing. Be flexible. Despite all the planning you do, very few things in a room full of teenagers go according to plan. I am still so bad at this, but I’ll say it anyway – be prepared to change your plan on the spot to adapt to what has happened in the classroom. My first year, I taught 3 sections of Physics, and no matter how bad a lesson plan went in the first class, I would do the same thing again in my other two classes and have another two painful 45 minutes. Why Bowman, why? Be positive and patient and don’t take things personally. I used to pretend every morning that I was putting my “patience pants” on, and even considered writing the word “patience” in the waistband of all my pants. Kids do all sorts of annoying things, and it’s almost always just because they are in their own little world. It’s almost never a personal attack on you, though it often feels that way (“I put all this work into this lesson plan and they are ruining it by doing blah blah blah, they don’t appreciate my work”). And even if it is a personal attack or they are being annoying beyond belief, getting angry and impatient never solves the situation. You set the tone in your classroom with your demeanor, and the more positive that can be the better. Don’t forget to teach them how to be real people too. Far more important than the content you teach are the “habits of mind,” as my headmaster would call them, that students learn from your classroom. Teaching students how to organize themselves, take notes, ask questions, receive feedback, work in groups, be real people etc. felt like a huge waste of time at first (we must cover more material!) but I have come to understand more and more its importance over the past three years. By the way, this is really really, really, really hard at first before you get a sense as you see kids succeed and fail what habits of mind are important. Change how you view mistakes. I wish I had known about Dweck’s Growth Mindset before I began teaching, because I think I wouldn’t have been so hard on myself about all the mistakes I made my first year. Some things will go as you planned, but others will be really messy and still others will go horribly wrong. It’s all about how you react to these mistakes. View everything as a chance to improve, a learning opportunity, rather than a moment of failure. Find ways to document your work. I think the most important thing I did my first year was organize myself very, very meticulously. I had every lesson plan, every worksheet and every assessment saved on my computer and carefully organized by unit. This helped so much in the year after in planning class because I could see what I had already done. What I wish I had done in addition (and will start this next year) is spend 2-3 minutes at the end of every class just writing a quick reflection about what had happened. I think that will make old work even more useful. Solicit lots of feedback. If you view mistakes as opportunities to learn, you can become more comfortable asking others for feedback on your teaching (PS I am really good at giving advice about things that I still struggle with myself). Invite other teachers to your classroom and then ask them lots of specific questions about what they saw (don’t let them get away with a simple “it was great!”). Poll your students often (every couple of weeks) about various things. Ask them specific questions about things you feel like you are struggling with and give them opportunities to make observations of their own. I still find this painful at times, but it is so helpful in improving my teaching that it is totally worth it. Take time off. Period. I take every Friday off as a rule (before you think I am crazy slacker, our weekend is Friday-Saturday over here in Jordan). Teaching is so consuming, and is one of those jobs where you could fill up any amount of time that you have with work. I knew I was going crazy at one point last year when I started having dreams about catching my Physics students drinking. If that starts happening, chill, work out, read books, watch TV, hang out with friends (but don’t talk about school) – even if it means your lesson plan wont be as meticulously planned as you hoped. I have a few friends that are starting to teach this upcoming school year and they emailed me asking for advice. It feels a bit strange being asked for this advice, as I still feel so new myself, but I realize that there is so much that I would want to say to someone starting teaching to help them along what is inevitably a difficult experience. From a quick poll on twitter, I realize that everyone else has so much to say too… and it’s not always the same things! So, with some encouragement from twitter colleagues, I am collecting advice for new teachers. Please help the first year teachers in the world by writing a letter to a new teacher. Include advice, anecdotes, resources – whatever you want! It could be as long or as short as you want. I’ll give everyone a little more than a week for submissions, and then I’ll compile the advice in a blog post with links to your blog (which could be a really cool jumping off point for someone trying to join the blogosphere) and also in a document if you have new teachers that you want to just send something. Just make sure to mention me on twitter with any submissions (@bowmanimal). I’ll compile everything between blog posts and tweets (and @crstn85 will compile blog posts at Drawing on Math’s #matheme page too, so it would be good to add that hashtag too). If you don’t have a blog or twitter, feel free to email me submissions to me – bowman.g.dickson at gmail dot com.